It’s easy to get swept up in the excitement of buying a home. And as well you should, it’s an exciting time! However, before you make a significant financial commitment, it’s best to know exactly what you’re buying. When you hire a home inspector, you get a professional, in-depth examination of the property’s structures and systems. It’s a worthwhile investment that can save you money in the long run, either by warning you away from a ‘money pit’ or by providing a list of deficiencies you can use to negotiate with the sellers. The inspector’s report will also list minor repairs that, if made, will help to maintain your home over the long term. Additionally, a good inspector can often predict the standard life expectancy of your roof, HVAC, and other big-ticket items so you can start planning for their eventual replacement or use this data to negotiate a well-informed and more advantageous offer. Many buyers rely on their home inspector to point out issues with the property. However, by conducting your own visual assessment before you submit an offer, you can factor expected expenses into the offer price. Not to mention that spending more time in the house will give you a better feel for the decision you are contemplating moving forward with. Or conversely, if you suspect major problems, you may choose to move on to a different property altogether. Overall, does the home appear to be well maintained? Unless it’s a highly-competitive seller’s market (like it is now in Orlando in the summer of 2018) consider the overall condition of the property BEFORE you submit an offer. Work with your real estate agent to factor in repairs and updates you know you’ll need to make when you determine your offer price. We all love to save money, but not all inspectors are created equal. That’s experience talking! Before you hire one, do a little research.2 You may even want to start shopping for an inspector before you complete your home search. In fact, I would strongly recommend doing just that. Inspection periods are typically short, so it’s always best to be prepared. Find out what is (and what isn’t) covered in the inspection and if they utilize the latest technology. Ask to see a sample report so you can compare the style and level of detail provided. Finally, make sure you feel confident in the inspector’s abilities and comfortable asking him/her questions. You’ll be so glad you made the time to choose a trustworthy inspector. Of course, if you do choose to tag along with your inspector, exercise good judgment. At the bear minimum you’re looking at 2 hours’ worth of inspections to be completed. Your inspector may also flag some minor items that you wouldn’t typically expect a seller to fix. However, ignoring these small issues can sometimes lead to bigger problems down the road. Make sure you read everything in the report, so you can take future action if needed. Some buyers are too embarrassed to ask questions when there’s something in the inspection report they don’t understand. 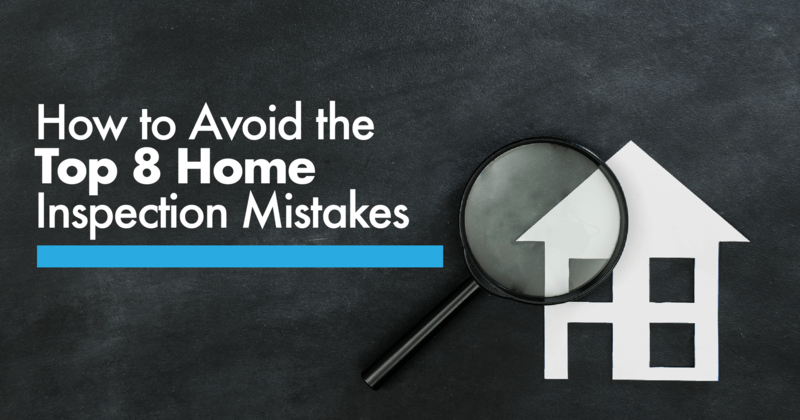 Afraid they might look foolish, they avoid asking questions and end up uninformed about important issues that could impact their home purchase. Don’t make this mistake. If you’re in the market to buy a home, we can help you navigate the inspection and all the other steps in the buying process … typically at no cost to you! Tap into our expertise to make the right decisions for your real estate purchase.